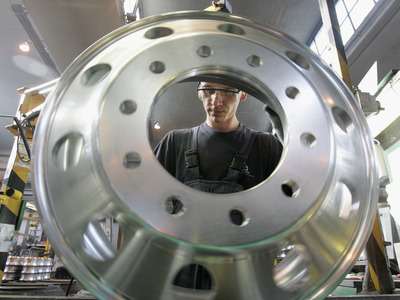 Sean Gallup/GettyA worker performs a quality inspection on forged aluminium truck wheels along the manufacturing line at the Alcoa aluminium factory October 24, 2006 in Szekesefehervar, Hungary. Alcoa bought the factory, once one of the main suppliers of semi-finished aluminium in the former East Bloc, in 1993. Durable goods orders fell 2.2% in May, according to the Commerce Department. Economists had forecast that durable goods orders fell 0.5% after a revised 3.3% rise in the prior month, according to Bloomberg. “Corrections in the volatile vehicles and defence components pulled down the headline, offsetting the small increase in orders for non-defence aircraft,” said Pantheon Macroeconomics’ Ian Shepherdson in a note.